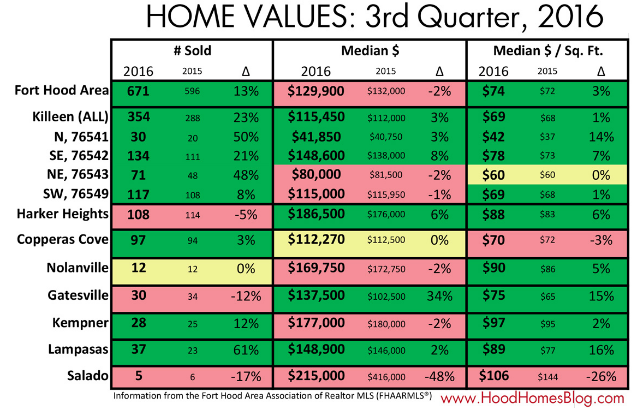 KILLEEN-FORT HOOD – Third quarter 2016 foreclosures fell from 21 percent to 18 percent of the market and the price per sf rose 3 percent versus 3Q 2015 for the Fort Hood area. The Fort Hood area overall saw a drop in the median price, but most areas of Fort Hood saw a rise in the price per sf of homes sold, most likely due to smaller houses being sold for more. In addition, 13 percent more homes sold this quarter than last quarter.